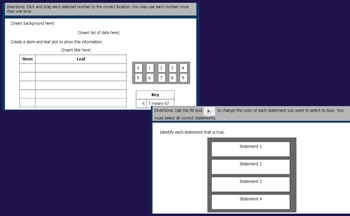 This is a set of 19 fifth grade math Virginia SOL Technology Enhanced Item (TEI) Templates. The templates are created to look very similar to the TEI Items on the VA SOL Tests. They are created in Google Slides. The pdf in the zip file includes the link to the Google Slides file which you can make a copy of and edit. Each question template should be quick and easy to fill in with the problem of your choice. You can make multiple sets of questions with this one set of templates. The preview shows some of the templates that are included. The purchased download will include the link to the Google Slides file for you to make a copy and edit. If you are a Google Apps for education school, once you have edited the templates to be questions of your choice, the file can be delivered to your students easily via Google Classroom, which will make a copy for each student. If you are not a GApps school, the file can be projected and you can work through them as a class. In this file, there are drag and drops, fill in the blanks, and hot spots. There is a parallel version of every TEI item on the current SOL practice items and most recent released test items (as of 3/21/16). If you are looking for a set of ready to use parallel questions for the SOL, check out my set.